@JustBoom, @support, I have a Raspberry Pi with RoonBridge installed and it is all working except the IR remote control. I followed the instructions on the Justboom website to install the IR receiver on my Justboom DAC. The receiver is receiving signals from the remote but is not controlling RoonBridge. The .lircrc config file tries to call mpc which I do not have installed. If I run irexec I get “/bin/sh: 1: mpc: not found”, so it is all working up to that point. How do I configure this to work with RoonBridge? That is pretty much the same as the instructions on the Justboom website and it all works, in the sense that the IR receiver receives the signal from the remote and recognises what button has been pressed. The problem is that it then tries to pass this to mpc, which I do not have installed. I want it to pass the commands to RoonBridge, to control what Roon is playing. I have opened a help ticket with Justboom, but no rely so far. Can someone at Roon help me? Roon on the pi is linked to Alsa hardware volume. 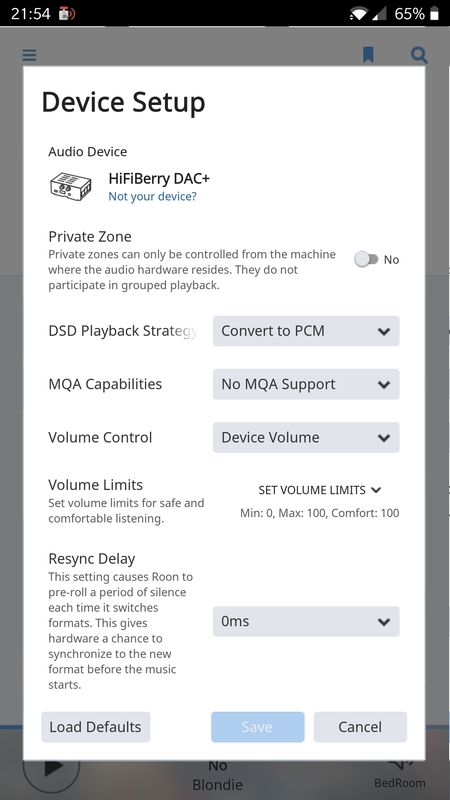 If you have device volume selected in Roon then it should just control the alsa hardware master volume. I can control Roons volume from other apps that are open at the same time using UPnP. So if the JustBoom is controlling hardware volume in Alsa then in theory it should work. Not sure if you need to change anything in the Alsa config for this though. In Roon remote I see three devices on the Raspberry Pi, the Justboom DAC HAT, the Alsa device on the Raspberry Pi and the HDMI Alsa device on the Raspberry Pi. I am not using the devices on the Raspberry Pi, I am using the DAC attached to it. How do I get the Justboom remote to work with RoonBridge? 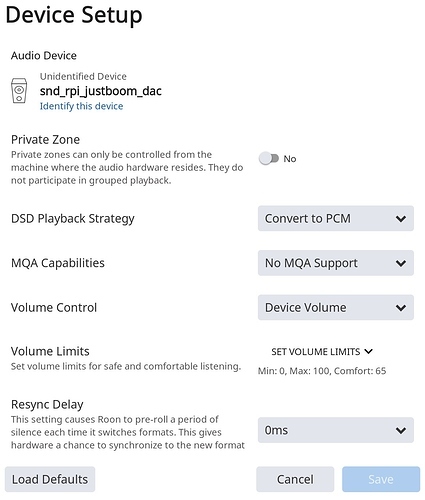 Do you have device volume selected in the audio settings for the device? I have had some communication with Justboom but they seem unable to make this work. but it makes no sense to me, it is a long time since I programmed anything. Also, I see that Ropieee has support for flirc, but I can’t see how it controls Roon. I have the hardware part working, if I do “mode2 -d /dev/lirc0” then I get input, I just can’t get it to control Roon. RoPieee uses Roon’s API to control volume. I’m willing to add support for this to RoPieee. One of you just has to install RoPieee, and send me feedback (RoPieee has a function to send me analytics). Just to be sure: you have the Smart Remote and not jus the IR? Because I don’t see a (USB) receiver. No, I have the IR remote. That’s not gonna work. You need a receiver, in this case an IR one. The Justboom HAT has the capability to have an IR sensor added, one is included and just needs to be soldered into place. I have done this and configured it and I can see on the command line that it is working and receiving input. The problem is that it is not controlling Roon, the config file is not passing anything to Roonbridge. Ah. Didn’t know that about the Justboom. So what are you using then? lirc? can you show me your config? I just installed RoPieee and have the default config files. 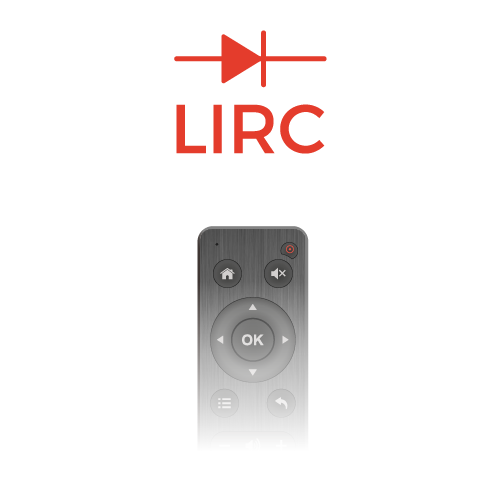 Set Up LIRC For Your JustBoom IR Remote This guide will show you how to configure LIRC on a Raspbian based OS. 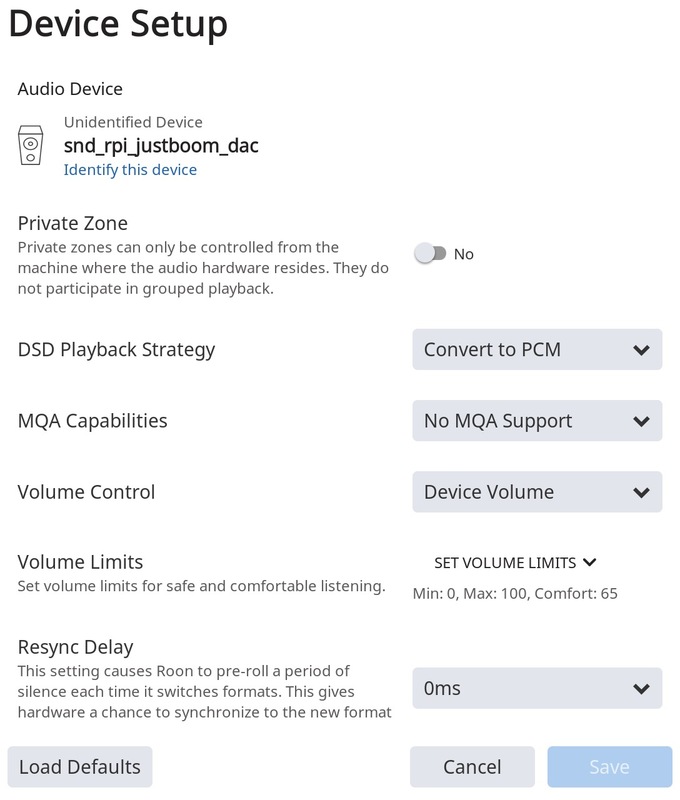 Despite the fact that this guide has been created for the JustBoom IR Remote it can also be used for other IR remote controls. On both distributions I have verified that the hardware is working, but the DietPi and Roon Web Controller tries to call mpc, I don’t know what RoPieee is trying to call. Without a JustBoom I can’t get this to work. @Chris_Rush - can you help Harry out here? Obviously I want to get this working, but don’t want Harry putting in loads of work just for this one-off case.